The Ford GT was the firm's birthday present to itself ... or, anyone with a spare $203,599 lying about! Created to mark the company centenary, it was released in 2005. The new GT was inspired by one of the finest cars Ford had ever produced. The iconic GT40 racer was a multiple Sixties Le Mans winner. The new GT40's prototype débuted at the 2002 Detroit Auto Show. Feedback was fulsome! In short order, Ford confirmed that they would be putting the prototype into production. 4,038 GT40s were built ... somewhat shy of the 4,500 Ford had envisaged. But, if the GT's styling harked back to the past, on the technical front, it was cutting edge. A venturi - cut into the floor-pan - provided plenty of down-force. High-speed grip was further enhanced by huge Goodyear Eagle tyres. And the GT40 needed every bit of that grip - as its 5.4-litre engine pushed traction to the limit! The aluminium V-8 was fitted with a Lysholm supercharger. The cylinder-heads were fastidiously fettled. There were high-lift cams. When Ford's engineers were finished, there was 550bhp on tap. Torque was massive - 0-60mph turning up in just 3.7s! The car's body and space-frame chassis chipped in, too - both being forged from light aluminium. Transferring the torque to the tarmac was independent, double wishbone suspension. Despite its power, this car was more practical than its predecessor. 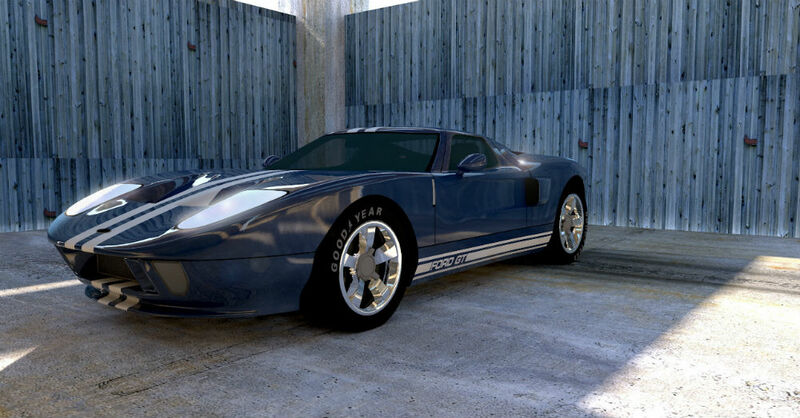 GT40 referenced its height - all 40″ of it! At least this version was wider and longer. As far as head- and leg-room went, then, things were looking up! In performance terms, too, the new model was more user-friendly. Those titanic torque stats translated to to-die-for acceleration. The GT, though, could mood-shift in an instant - and cruise, seemingly without effort. Saying that, the 6-speed transmission was there, if required. With the new GT, Ford had homed in on the ultimate all-rounder. It took the sales fight to its supercar rivals! A top speed of 204mph was more than competitive - and was served up in manageable, safety-first form. Ford's new GT40 was a meticulously-crafted celebration of speed.